This week, Beneful got a lot of press over a commercial that recently started airing in Austria. 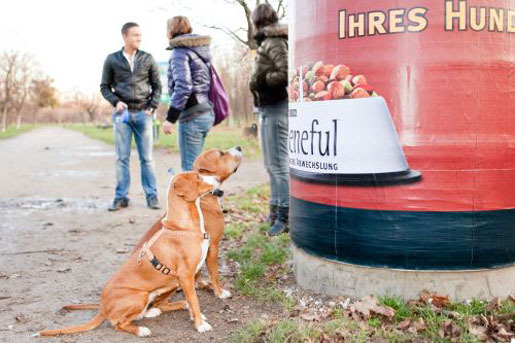 How does a dog food commercial create such a buzz? 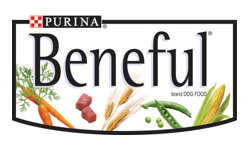 Well, the Beneful commercial was one of a kind because it was intended to grab your dog’s attention, not yours. Woven through the commercial are squeaky toy squeaks, dog whistle-like sounds, and high-pitched pings…this all according Nestle itself. Some of these noises you will be able to hear…some are meant just for your pooch. I personally think this is a wonderfully clever idea. First of all, it’s getting a lot of dog lovers talking. Second, it has the potential to be very effective. If I walked into the room, and my dog was 100% focused on what was playing on our TV, I would definitely take notice. Just like I would take notice if I ever encountered one of Nestle’s “Stop-Sniffing” posters. You can only find them in Germany, but when I read about this I thought they were GENIUS! The posters smell like Beneful. Oh my gosh! Seriously! That is AWESOME! What an amazing idea….and can they make them for humans? But no naps for Buffy just yet! The Nestle website (the German one at least) has “Dog Type Test.” By using sounds found in the commercial, you can discover if your dog is more “playful rascal” or “sensitive dreamer.” Buffy reacted to all of them with curiosity and intrigue (although I think she was leaning more toward “playful rascal.” ) I seriously recommend trying it with your pup. It was fun, and all of the sounds got adorable responses. I would love to hear how people’s dogs reacted, so let me know! While a dog food commercial that caters to dogs might not be the most practical marketing strategy, I do think that it is definitely a sign that dogs are becoming more and more a part of our families – and therefore more influential in family purchasing decisions. If I thought that spending a few extra bucks on a different dog food would make my pup happy, I would do it without a second thought. And I wouldn’t even mind that she couldn’t front me the cash or thank me for doing it.